Rane will scan the chart for two consecutive low points or two consecutive high points. Once these points are acquired, they are linked with a trendline and if their slope and origin match our criteria, they will remain active on the chart for Rane to trade based on them. There is no requirement for both lines to coexist at the same time, a line of lows can exist without a line of highs and vice versa. The line linking the highs is called the Top Trendline, and the line linking the lows is called the Bottom Trendline. 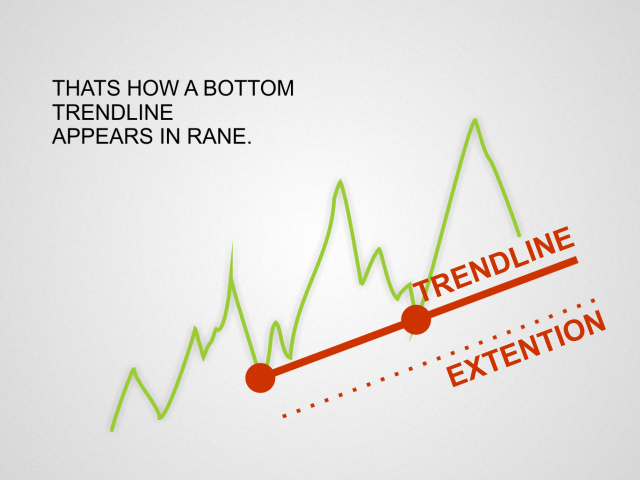 Per the trading needs of Rane, the Top Trendlines will only be utilized if they are descending and the Bottom Trendlines will only be utilized if they are ascending. You will also notice a supporting line at a distance which is used in stops and in initiating trades. The Top Trendline has a line above it, while the Bottom Trendline has a line below it. A trade will be taken close to the trendline, it will be a short (sell) [only the top trendlines that go down are used]. A trade will be taken when price breaks above the Top Trendline, it will be a long (buy). A trade will be taken close to the trendline, it will be a long (buy) [only the bottom trendlines that go up are used]. A trade will be taken when price breaks below the Bottom Trendline, it will be a short (sell). RANE Instance Tag - instance tag is used in order to deter issues with the logs saved on your hard drive. Buffers Initial Load - initial scan Rane should perform upon launch to capture chart highs and lows. Rane Trading - enable or disable trades by this Rane instance. Rane Terminal Alerts - receive MetaTrader 4 alerts or not. Rane Send eMails - receive emails or not. 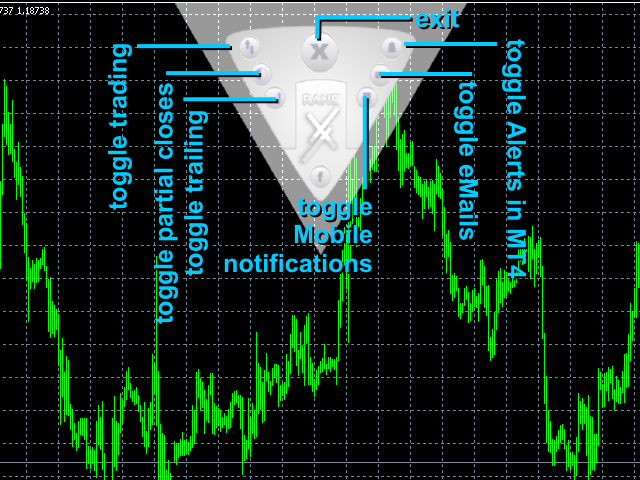 Rane Mobile Notifications - receive notifications in your Android device MetaTrader 4 or not. Trendline Bands % of Block Size - size of the trendline extention line (above or below), its distance from the main line as in a % of the block size. Dilute Bands With Highs and Lows - if enabled, each bar contributes to the dilution of the bands distance based on how bullish or bearish it becomes. Top Trendlines Minimum Breach To Trade and Maximum Breach To Trade - set the first break of the trendline that will be traded, and the last one. 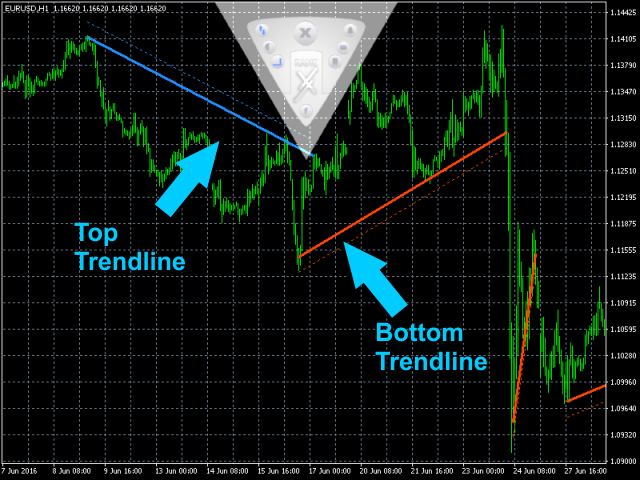 Deactivate Previous Similar Trendlines - keep this setting on in case you enter multiple breaks of a trendline (max>1). The reason is you do not want this trendline to keep extending indefinitely in case its maximum breaks amount is not reached. 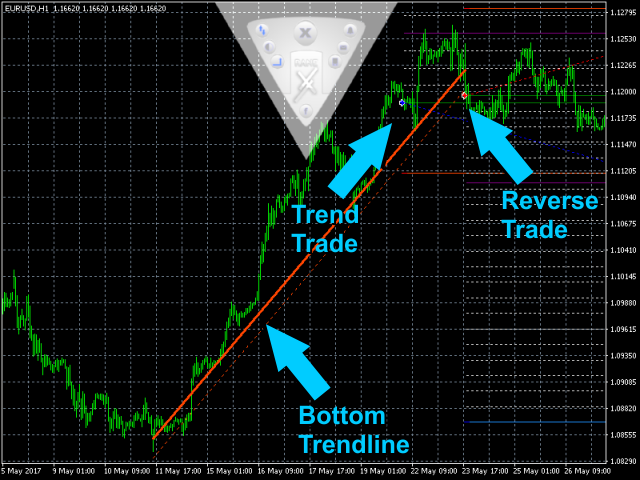 Main Trendline - trade will be taken when price closes breaking the trendline. Edge Of Trendline - trade will be taken when price closes breaking the Trendline Extension Line. Trendlines Based on Range - range and frequence of trendline discovery. Trendline Bands Based on Range - same as before but for the distance of the trendline to its extention. 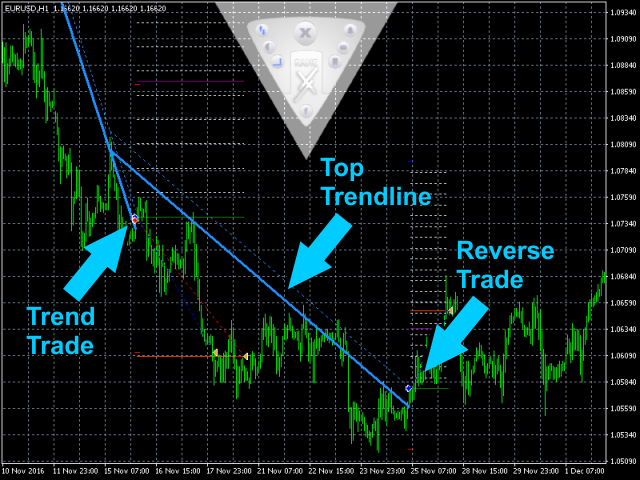 Rane Reversal Trades - take trades when the trendlines (or their extentions, depending on your settings) are broken. 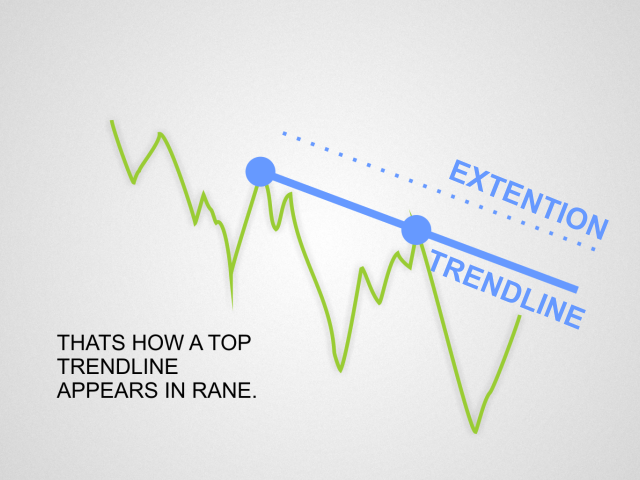 Rane Trend Trades - take trades when the price approaches the trendline toward the direction the trendline is moving. Rane Trend Trade Application Range - the higher the range, the more volatility must exist within the spectrum of the trendlines duration for the trend trade to be taken.